The scotch egg gets a makeover! Creamy soy sauce marinated egg, wrapped in a delicious pork dumpling filling, and coated with super crispy panko, fried to golden-brown, and dipped in a curry-mayo sauce. Mind blown! If you’re unfamiliar with a scotch egg, it’s a popular dish served in the United Kingdom. Traditionally it’s a hard-boiled egg, wrapped in seasoned sausage, rolled in breadcrumbs, and then fried. To give it a Japanese spin, I started with a soy sauce marinated egg (shoyu egg), often a topping for ramen. I then adapted a pork dumpling filling that I like to use when I make gyoza (pan-fried Japanese dumplings). It’s then rolled in panko and fried to golden-brown and crispy perfection. To top it off, it’s served with a delicious curry-mayo. Is your mouth watering yet?! If you saw my last post (Lox Summer Rolls with Avocado-Lime Dipping Sauce), you may have noticed that I posted my very first video! It was so much fun to create and it certainly helps to demonstrates techniques that my be unfamiliar – sounds perfect for a dish like this, eh? Well… I kinda did a stupid thing. Ok, it was unbelievably stupid! Creamy soy sauce marinated egg, wrapped in a delicious pork dumpling filling, and coated with super crispy panko, and dipped in a curry-mayo sauce. Mind blown! To make the soy sauce marinade, grab a medium bowl (actually a 2 cup measuring cup works nicely, due to its narrow base and high walls). Combine the water and sugar. Stir until the sugar dissolves and then add the sherry vinegar and soy sauce. Set aside. Prepare a bowl full of ice water and bring a large saucepan filled halfway with water to a boil. Gently lower the eggs into the boiling water one at a time, using a spoon. Cook for exactly 6 minutes and 50 seconds. Remove the eggs as soon as they are done and transfer them to the ice water. Once cool, gently peel the eggs (the yolks will be soft, so the eggs will be a bit delicate). Transfer the eggs to the soy sauce mixture and marinate in the fridge for 2 to 6 hours. Make sure they are completely submerged, use a small plate placed on top, if needed. When you're ready to make the Japanese scotch eggs, prepare your breading station. Place the flour, egg, and panko in 3 seperate bowls. In a medium bowl, combine the pork, garlic, ginger, scallion, salt, and a few cracks of pepper. Divide the pork mixture in half. Working with one piece at a time, roll the mixture between your hands to form a ball and then flatten with the palm of your hand - large enough to wrap around an egg. Place a soy sauce marinated egg in the center and wrap the pork around the egg, sealing to completely close and pinch off any excess pork. Repeat with the remaining soy sauce egg. Working with one wrapped egg at a time, gently roll it in the flour, shaking off the excess. Then coat in the beaten egg and roll in the panko to completely coat. Heat a large, heavy-bottomed pot over medium-high heat. Pour in 2-inches of oil and heat to 375 degrees F. Carefully add the panko crusted eggs to the hot oil. The heat will drop when you add the eggs, but that's ok! You actually want to cook them at 350 degrees F (make sure you maintain this temp throughout the cooking process). Cook, turning occasionally for 5-6 minutes, or until golden-brown. Using a slotted spoon, remove the eggs and allow to drain on a paper towels. In a small bowl, combine the mayo and curry powder. 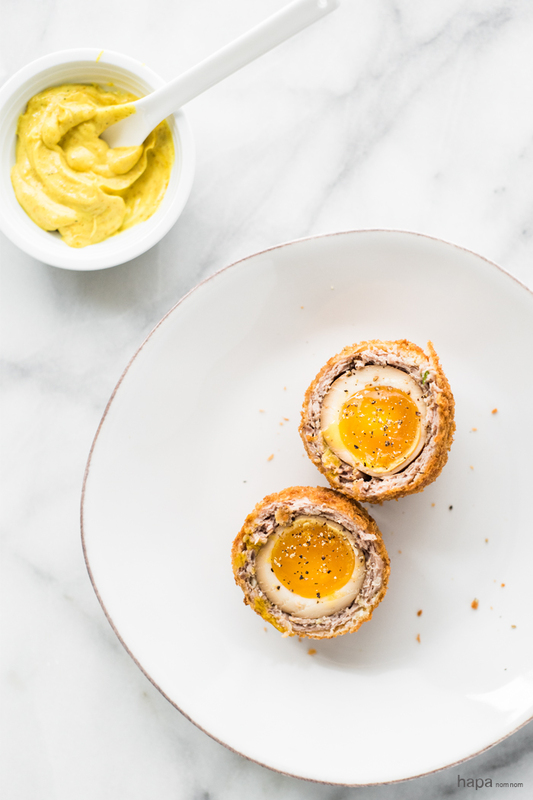 Serve the Japanese Scotch Eggs and with the curry-mayo immediately. Enjoy! * You can make the soy sauce eggs ahead of time. They will keep for a month, refrigerated, in a tightly sealed container. * Keep the soy sauce mixture if you'd like to marinate more eggs. I’m glad that I found your website. I love Scotch eggs. My mother made them with Chinese fishcake paste. I’ll try making this with pork and fishcake. Thanks for the inspiration. I’m glad you found me too! 🙂 A pork/fishcake sounds like a great combo – I’d love to know how they turn out! The soy sauce egg is the first thing I eat in a bowl of ramen 🙂 Thanks for your link, I’ll check it out! the ground pork i have in the fridge was for another dish that i am now sooooooo ditching. you and your egg partial video make me insane. i am making these immediately!!! I was seriously just thinking about you! I was hoping you hadn’t forgotten about me 😛 I love, love reading your comments and I hope you enjoy the Japanese eggs! Scotch eggs are a popular pub snack in England and I love them. These are a delicious twist that I must try. 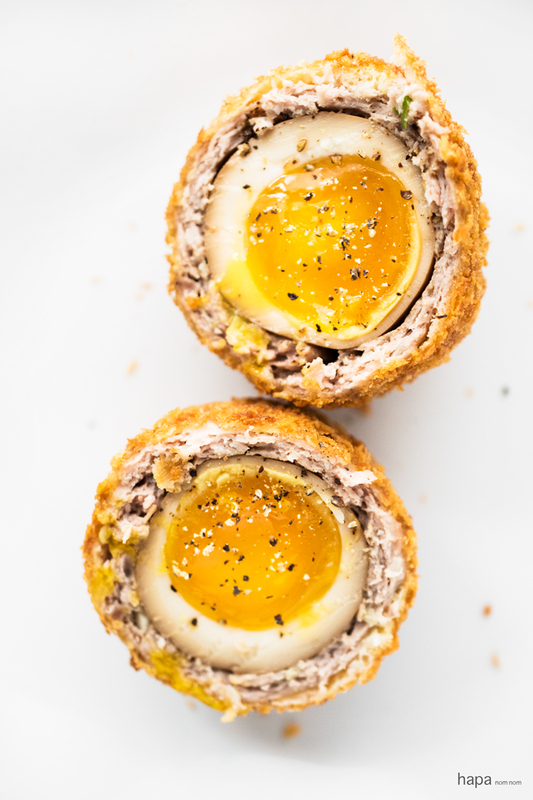 Awesome twist on a scotch egg! Aw, Kathleen! I’m so sorry about your video. I’ve done that too, with photos … and AFTER I’ve written my post and everything. At least we have this gorgeous scotch egg to cheer us up. I grew up eating these at parties, and now they’re like ‘cool retro food’! I just LOVE how you’ve adapted this and made it Japanese. Just genius! Oh Kathleen, I’ve totally done that before where I’ve accidentally erased the video files. It’s horrifying and awful! 🙁 But I just saw your last video and it was gorgeous, so I can imagine that this one would be just as beautiful too. I enjoyed watching you slice the egg, if that counts! 🙂 This japanese rendition of the scotch egg is awesome and so creative! I can just imagine the flavor and texture explosion here…uhmazingggg! Yes, from now on… I’m not deleting a single thing until the post is up! Thanks, Anu! I hope there are many more to come. 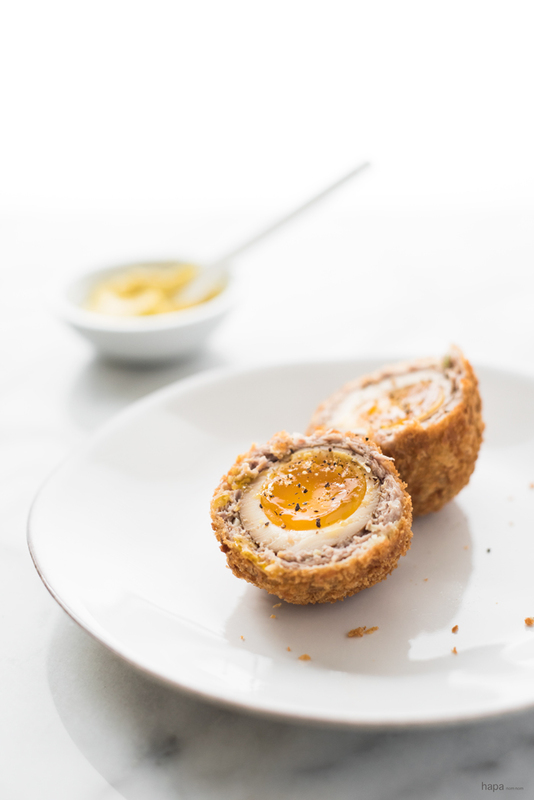 Loving your Japanese inspired scotch egg, with the soya egg, dumpling exterior in a panko breadcrumb and then if that was not good enough a mayo curry dipping sauce. Drooling over here!!! Oh my Kathleen…oh the woes of accidental cleaning. However, I still love your short and sweet video with its upbeat tunes. I would love to see you do videos and using a GoPro you could probably do some pretty cools shots – like extreme cooking! And I hate moving too. Are you staying in the area? We would totally destroy lunch! I’m still surrounded by boxes but hopefully will have some time to get out the GoPro this weekend and play around with it. Thinking of doing a YouTube channel with my dogs too (we got them a dog harness) so my family can see more of their antics. We moved 30 minutes south of where we lived before, so kind of staying in the same area. Didn’t you move from the East coast to the SF Bay area? Yeah, we moved from Atlanta to Oakland. 4 days in the car with 2 young dogs was definitely interesting 😛 Hope you get settled into your new home soon!